Hey, all reader guys, this is the very busy CARLMAN with a few quick items. First, our faithful follower Jana sent a note about Darth Bill's review of The Monstrumologist and the new Alex Rider book. The Monstrumologist sounds really good but everyone talks so much about the gore I don't know if I can "stomach" reading it! Are you as excited as I am about the newest Alex Rider (Crocodile Tears) coming out this week? As you might know from my earlier rave about young James Bond I have a thing for teenage boy spies, and Alex is about my favorite. Every boy I have recommended the Alex Rider books to have enjoyed them--almost as much as I have! I hope you have read them because I think the are the bomb. Thanks, Jana! I have to confess that I haven't read any of the Alex Rider books and that's too bad. Everyone says they're great. Maybe I can read one after I catch up on the books I'm reading now. Then we had a good time with author and funny guy Mike Thaler today . He read from a couple of his books, drew pictures, and told us how to make up riddles. Maybe he'll give us an interview one day. In the meantime, go get his Black Lagoon books! They're funny! I have a pretty low gore tolerance, but I was enthralled by the book. Would I give it to under 6th graders? Hmmm. Maybe not. I agree Ms. Yingling. Thanks for the reader age advisement. A place for boys to find terrific books and tell other boys about great reading. 1. Every post has a place underneath it that says "Comments". Click on it and it will take you to a place in which you can write something. When you're done, click on a way to identify yourself. You don't have to create a Blogger/Google account (unless you already have one); you can click on "Name/URL" or even "Anonymous." Then click "Publish Your Comment." We try to get your comments and reviews posted right away, but sometimes we get busy with other duties. So, if you don't see your comment right away, don't panic. We'll post it soon. Don't forget--any boy can get a free book the first time he writes a review. If you live too far away to come to the Myers Park library, go ahead and write to us anyway. We'll try to find a way to get a book to you. Besides, all the other boys out there would love to hear from you. When you tell us about a book, please give the title, author, what the book is about, and why you did or didn't like it. 4. Did you notice that the posts from last year don't show up month by month as they did before this year? If you click on the triangle next to the previous years, the months will drop down and you can go back and see what we and your fellow readers have written. Being Horrified While Mysteriously Laughing!!!!! The Author From the Black Lagoon Will Be Here! The Carlman and Darth Bill on Stage!!!! GUYS READ--a really good site run by Jon Scieszka, a terrific author. Great place to find books boys are sure to enjoy. BOOKHIVE--our library's book review site for kids up to 6th grade. Lots of good stuff here! THE 39 CLUES--a great site for a great series! BOOKS FOR BOYS--a blog by an author who used to hate reading but now enjoys it and writes good books especially for boys. SMS GUYS READ blog--not to be confused with Jon Scieszka's site. It's a blog that boys and an adult use to tell about their favorite books--like we do! 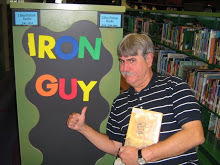 MR. K READS--a terrific blog blog run by a 5th grade teacher. Really good book recommendations. THE READERS AND WRITERS PARADISE--another great blog run by an actual GUY! He's been reviewing books and making good recommendations for five years. THIS KID REVIEWS BOOKS--a good blog by a BOY just like you! Good reviews of books for all ages. JUSTIN TALKS BOOKS--yet another great blog run by a BOY who loves reading even though he used to hate it. SO YOU WANNA BE AN AUTHOR?--Do any of you want to be an author? Here's the inside scoop from from Lenore Look, aurthor of the Alvin Ho books. 1. Since the Iron Guy works for the terrific Charlotte Mecklenburg Library, I review only books that the library already has or will get soon. 2. If you are an author or publisher or agent and think you have a book that boys will go crazy over, please leave me a comment (with your email address so I can contact you) under any post. I will look and see if we have the book. If not, and if the book looks good, I will contact Those Who Order Books and see if CML would be interested. (Please note--CML does not usually order self-published books) PLEASE do not just send me a book! I appreciate the offer but but first I want to see if CML has it or will get it soon.